There were 302 mountain gorillas living in the Bwindi Impenetrable National Park, Uganda in 2006. 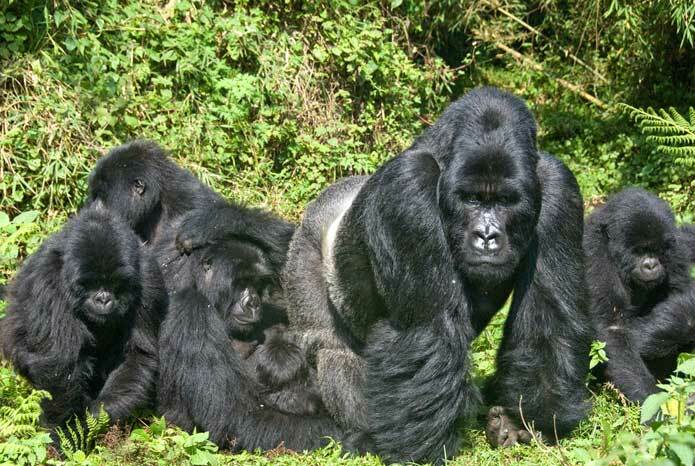 A further census taken in 2010 in the Virungus mountainous region spanning Mgahinga Gorilla National Park (Uganda), Volcanoes National Park (Rwanda) and Virunga National Park (Democratic Republic of Congo) found just 480 mountain gorillas. This means that the world's last remaining population of African mountain gorillas is less than 800. These last surviving mountain gorillas live within just two confined regions of Africa that are 45 kilometers (28 miles) apart. These gorillas are slow in reproducing, a further threat to the survival of these magnificent primates. Within their 40 to 50 year lifespan, female gorillas typically only give birth to between two and six babies. Visit the African Wildlife Foudation website to learn more. Lowland and Mountain Gorillas are ground-dwelling, predominantly herbivorous apes that inhabit the forests of Central Africa, including Rwanda and Uganda in East Africa. Mountain Gorillas are one of the most endangered species in the world. It is estimated that less than 800 Mountain Gorillas are left in the wild and that half of these are in Uganda. 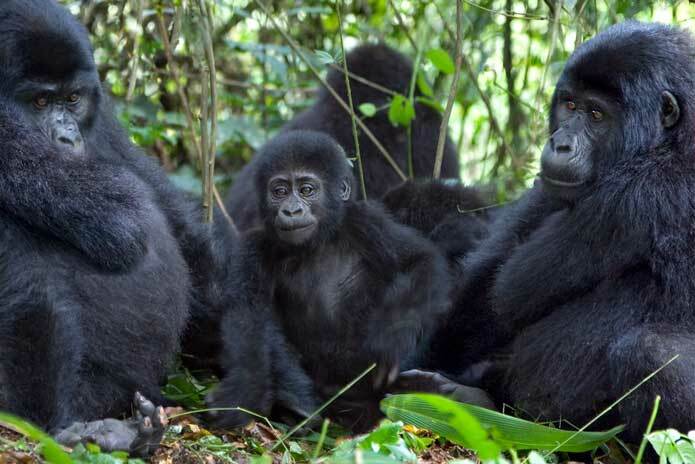 Groups of Mountain Gorillas are also found in Rwanda and the Republic of Congo. Undoubtedly one of the main attractions to Uganda, it is not for the faint hearted though. Gorilla tracking is strenuous and as little as 30 minutes or 7 hours can be spent in the forests and hills of Uganda searching for a habituated family. Tracking typically starts at 8:30am daily. It is imperative that visitors are physically fit before taking on this activity. Only 8 people are allowed to track a family group per day. A total limit of 24 people (4 groups) are permitted to track in Bwindi Impenetrable National Park daily and only one group of 8 is allowed in Mgahinga Gorilla National Park daily. The reasoning behind the numbers is that groups only visit one family of Gorillas a day and there are 4 groups in Bwindi and one in Mgahinga. Another reason is that it minimizes exposure to human diseases and infections and keeps the risk of behavioral disturbances to a minimum. If a visitor is sick, he or she will not be permitted to go out on the trek. Visitors have to have a permit to track to Gorilla families. When booking with an operator the permit will usually come as part of the package bought for the trip. However if visitors are booking directly then permits may only be bought from the Uganda Wildlife Association headquarters in Kampala. These permits are available two years in advance and they are limited therefore sell out extremely fast. Visitors can only track the Gorillas with a guide. It is a good idea to book permits at least 5 months in advance. It is important to note that seeing the Gorillas is never guaranteed. 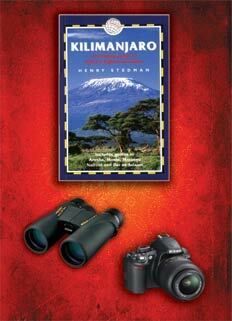 The expert guides and trackers will rely heavily on their skill and knowledge of the area. They take part in the habituation process of the families and know them intimately. On the day of the tracking they will go to the location where they left the family the previous day. The Gorillas however are wild and can move large distances overnight. Once the Gorillas have been found, the visit will only last for one hour. The guide may decide to cut the visit short if he thinks that the family is becoming agitated. This is an extremely strenuous hike and it is important to wear good hiking boots that are suited to slippery terrain and have good traction. Take along rain gear, a hat, sunglasses and sunscreen; the weather changes constantly. The Gorillas may charge at visitors; if this occurs, always obey the commands from the guide. Crouch down slowly and avoid eye contact. Do not run - ever! This is a wonderful way to observe chimpanzees in the wild and watch how they feed, play and care for their young. Uganda is one of 21 African countries where chimps are found in the wild, however the population in Uganda is probably one of the richest of those countries. 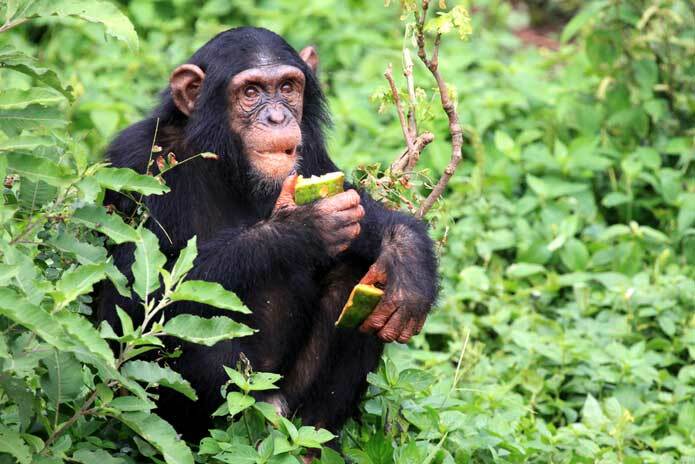 It is estimated that 4,950 chimps are found in this small country. The island is a project that started in October 1998 to provide a haven for orphaned chimps that were rescued by Ugandan Wildlife Authorities from poachers and traders. If there is no chance of reintroducing the rescued chimps to the wild, they are brought to Ngamba to live out their lives in safety. It is a collaborative effort between the Chimpanzee Sanctuary and Wildlife Conservation Trust, International Fund for Animal Welfare, the Jane Goodall Institute, The Ugandan Wildlife Education Centre and Zoological Board of New South Wales. The small 100 acre island is located in Lake Victoria 23km (14 miles) from Entebbe. It is a wildlife sanctuary that also provides a home to a variety of wildlife such as birds, hippos, crocodile and monitor lizards. It is kept as natural as possible and only compost toilets and solar energy are provided; and rainwater is collected. Day trips or overnight stays are available at Ngamba. Accommodation is provided in good self contained tents with a view of Lake Victoria. This is a wonderful opportunity to watch the chimps as they play and interact with one another. For the safety of all they are kept in a fenced off area and fed twice daily from platforms. It is possible to go on a forest walk with the younger chimps but visitors should research and book this activity early. A number of vaccinations are required for any visitor planning the walk. This is also a way to be a caregiver for a chimp for a day. The staff and guides will talk about what goes on behind the scenes and educate visitors about the sanctuary. Sometimes the little chimps will climb all over their new ‘caregivers’ and may even hold hands. The Park is found east of the Rwenzori Mountains near Fort Portal. There are a number of trails in the Park which makes it possible to track the chimps and other primates. Other primates to look out for are Red Colobus, Red-tailed Guenon, White-nosed Monkey, Gray-cheeked Mangabey, Blue Monkey, L'Hoest's Monkey, and the Black and White Colobus Monkey. Researchers have been conducting studies on Olive Baboon, Bush Babies and Nocturnal Pottos so visitors should look out for these too, they are used to having humans around. It is also possible to see chimpanzees in the Kyambura Gorge in Queen Elizabeth National Parkas well as the Budongo Forest in Murchison Falls National Park. However chances are not as good as in Kibale Forest or on Ngamba Island.